Since Polar Bears live in the Arctic, most of us will only ever see them in zoos. In their natural habitat, their white fur helps to camouflage them against the ice of their region. However, that white fur is quite a contrast to the greens and browns of other terrains. 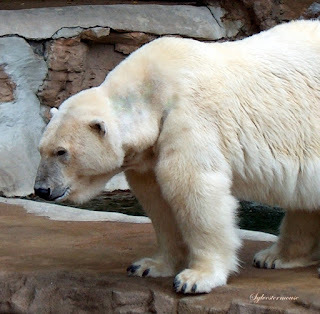 The Polar Bear has a longer neck than other bears which allows them a longer reach when hunting their aquatic prey. They have huge paws with bumpy pads that naturally help them get a grip in the ice of their Arctic region. They have small ears & short tails which helps reduce heat loss. 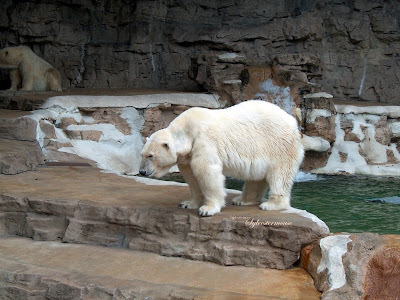 Even though I enjoy seeing Polar Bears in zoos, I often feel quite sorry for them. They are most often panting due to the heat. Even in colder weather, it is rarely cold enough for a Polar Bear to be truly comfortable. 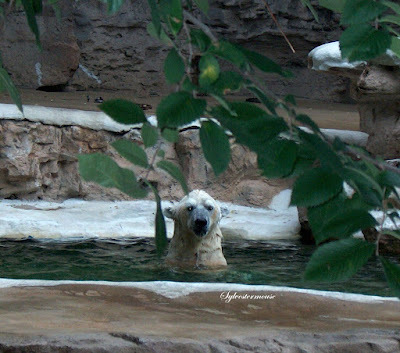 In the zoo, the bears cool down by swimming in the pools in their enclosures. 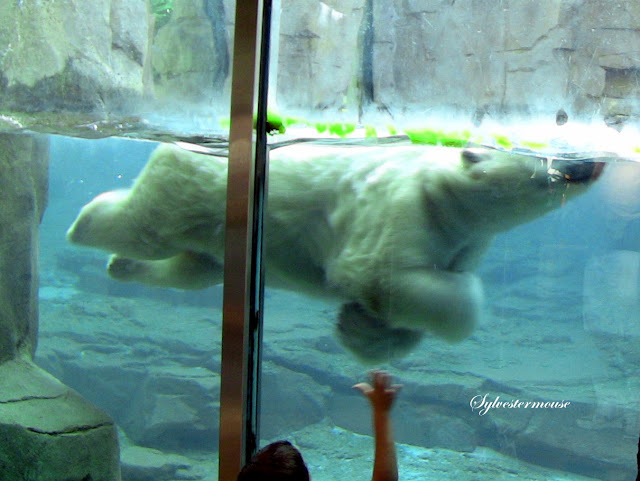 Several of the zoos that I have visited have viewing areas so you can watch the bears swim underwater. It is entertaining for us to watch a bear swim, but for them, it is quite refreshing and a great reprieve from the heat. Polar Bears are also referred to as Sea Bears. They are actually the only bear classified by several countries as a marine mammal. Their paws are also wide and flat which helps them to propel through water in spite of their massive size. Think of a paddle on a boat and how it can move a boat even without current. Polar Bears are excellent swimmers and have no trouble whatsoever swimming underwater. Weight: Up to 1100 lbs. Polar Bears You Can Take Home! What a cool photo of a swimming sea bear! I too feel sorry for them when they look hot and uncomfortable. Great polar bear pictures! 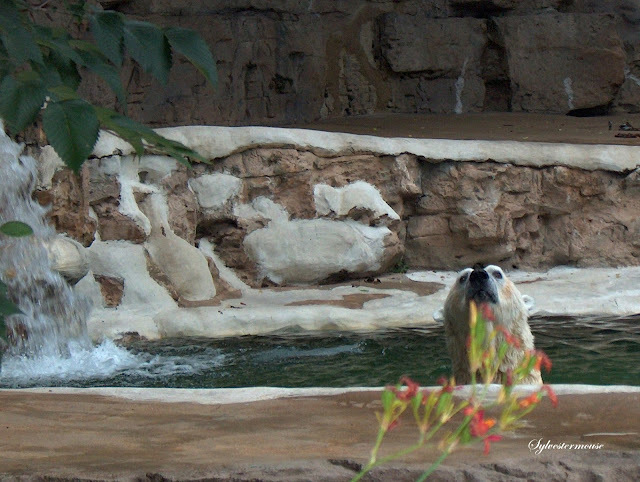 I especially like seeing the polar bear swimming underwater. I, too, feel sorry for polar bears living in zoos in warm climates. 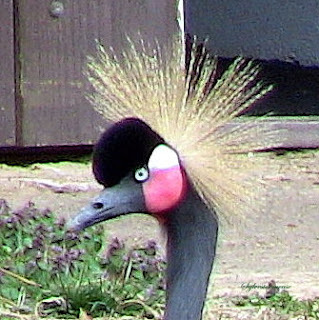 It is fascinating how suited each animal is for its native environment. I've learned something new about Polar bears, thanks to you.